Samone-Loreca has defied her life's struggles and become a prominent HIV educator for LGBT youth. That was in 1993. Samone-Loreca turned 49 in August, and she is not only still alive, but a beacon to Los Angeles’s activist community — especially to those fighting for the rights of people living with HIV. 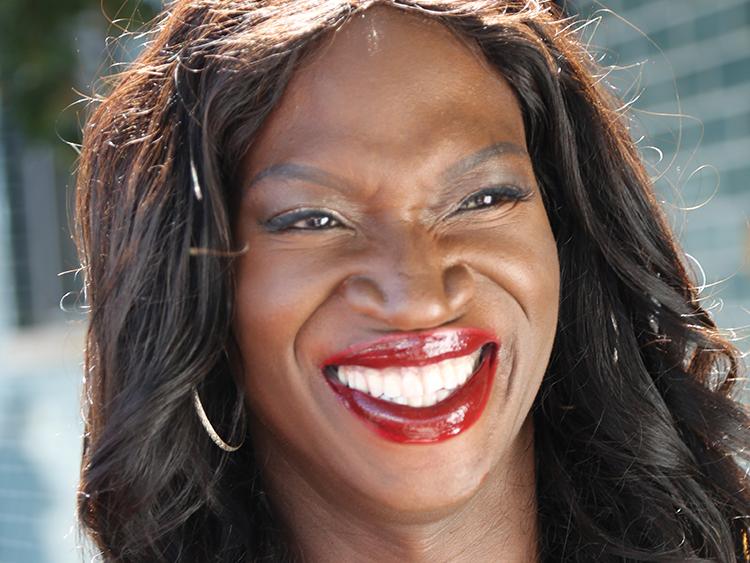 Samone-Loreca, who identifies as a trans woman, has a long and varied list of achievements: the first trans person to work as a clinical social worker at Children’s Hospital Los Angeles; one of the first trans women to serve on the city’s Commission on HIV; the first Black trans woman to be featured in an “HIV Stops With Me” campaign, in 2002; the winner of the Quest Pageant, a national pageant for trans women, in 2005. She was even the first known trans woman to be married in the state of California (in 2005, to her late husband, Luis A. Loreca). For every bad break — contracting HIV in 1987, when she was barely out of adolescence, from a boyfriend who had concealed his status — Samone-Loreca emphasizes another, equally impactful encounter: a stranger who gave her a place to stay; a doctor who told her he’d do whatever it took to help her stop using drugs. This good luck, when it strikes, is something Samone-Loreca has always felt compelled to share with those around her. At the Greyhound station in downtown Los Angeles, four days after leaving Atlanta, she found $100. She split the money among her friends, buying food and bus tickets to enable them all to get to San Francisco. There, she used what little she had to support other friends who were navigating addiction and homelessness — whether that was cash, temporary housing, or medication. gay and lesbian friends — she came into contact with violence early and often. It left her with an unplaceable rage and a near-constant sadness that she struggled to shake. However she may describe herself, Samone-Loreca’s friends all praise her profound ability to transform lives and create support. Samone-Loreca’s trans identity, in particular, was the culmination of numerous encounters with trans women who helped to open her eyes to the potential of her own womanhood. In Tampa, the year after she was diagnosed with HIV, she was inexplicably drawn to a woman she spotted standing behind a makeup counter in a local mall. Susan Forrest, the adoptive mother of two daughters who call Samone-Loreca their auntie, describes a friend and family member who is staunchly committed, regardless of the hurdles. Samone-Loreca and Forrest met five years ago when their mutual friend, the trans activist Alexis Rivera, was sick in the hospital with HIV. Rivera’s brother and his two daughters had been squatting in her house; when she died, Samone-Loreca took them in. Forrest and her wife became their legal guardians, but Samone-Loreca has remained a staple in the lives of the girls, now ages 9 and 11. Sabel Samone-Loreca’s weeks are now filled by commission meetings, committee appointments, and educational outreach engagements. Her goals are to reduce the stigma against trans women living with HIV and to increase her community’s access to services. She is a beneficiary of her own work — she secured her apartment in downtown L.A. through a public housing program that she advocated for, after she lost a previous apartment and spent months searching for a new home, unable to find a lease because of prejudice from landlords. Like what you see here? Subscribe and be the first to receive the latest issue of Out. Subscribe to print here and receive a complimentary digital subscription.